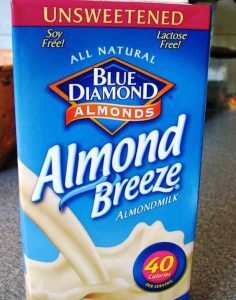 READ THE BOXED ALMOND MILK TRICKY LABEL! If you have taken on a Vegan life style and drink boxed almond milk because you believe it to be healthier, I invite you to read the very tricky label. In many cases it will list Calcium Carbonate: Also known as chalk, limestone and marble. Side effects: weakness/fatigue, constipation and kidney stones. It may also list Potassium Citrate: This citrate salt is not natural to the body. You can only get Potassium Citrate through a prescription from a licensed physician to treat renal tubular acidosis. Or you can get it in boxed almond milk. The FDA has listed Potassium Citrate as a ‘Pregnancy Category C’: may be harmful to unborn babies. The side effects for adults may be uneven heart beat, muscle weakness, dizziness, numbness and tingling in the hands, feet and mouth, as well as stomach pain. The most red flagged additive to boxed almond milk is Carregeenan, used as a thickener. It is an indigestible polysacchacide that is extracted from red algae. 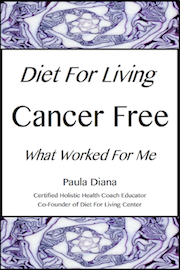 It is linked with gastrointestinal symptoms and stomach cancer. Lastly, Boxed almond milk is pasteurized at 175 degrees to extend its shelf life forever, wiping it clean of any life force. THE ANSWER: In the Vegan Living Food Diet we drink our Almond Milk fresh, clean, handmade, chemical-free, straight from the fruit of the almond. It is soooo easy to make, I want to share it with you. OUR DIET FOR LIVING FRESH ALMOND MILK RECIPE! Toss almonds in the blender with one cup water and blend until emulsified. Add the rest of the water and blend again. Strain through cheese cloth or nut bag. It’s that simple; pure almond milk in 5 minutes. Drink right away or store in the fridge for 3 days and use in blender drinks. Our Next 100% OnLine Class begins Summer 2019.